You may not recognise the artist’s name but you will recognise the art which #JosephFarquharson has created. Joseph Farquharson (1847-1935) was a Scottish artist who specialised in country and winter scenes. Many of these scenic paintings were turned into Christmas cards which were and still are popular. I purchased this very fine oil painting this past week. Those who recognised the name Joseph Farquharson will recognise this image. 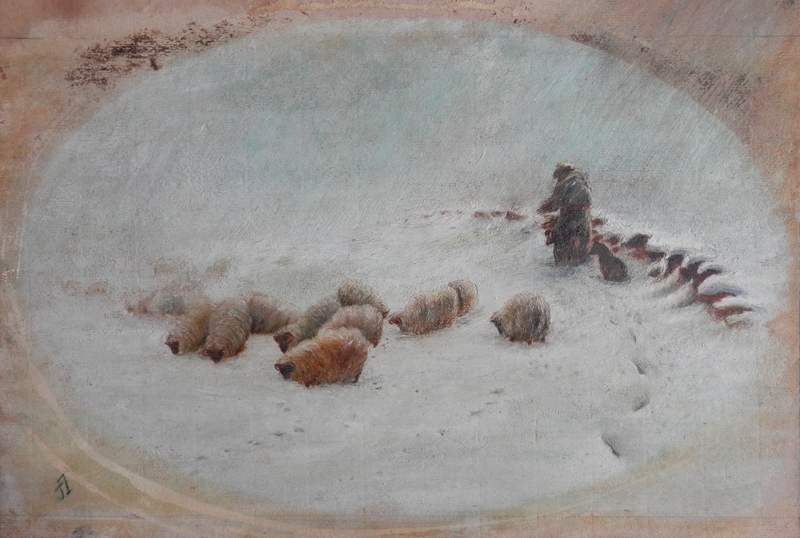 It is entitled #AJoylessWinterDay and was painted in 1883. The famous or final version of this image hangs in The Tate in London, England. From my reading so far, I have found there to be 5 known studies for the final setting. 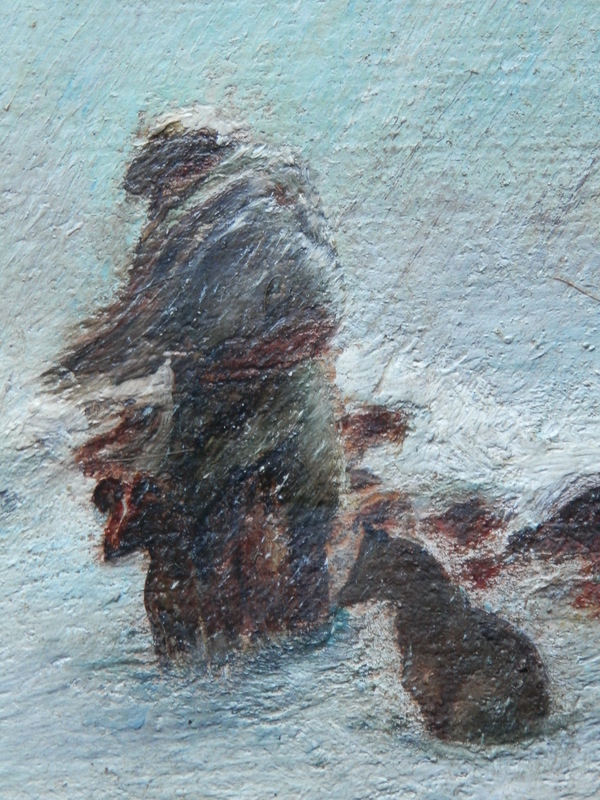 Farquharson was known for his winter landscapes – there is usually a human – a shepherd or farm labourer – involved also. Many of the landscapes come from the countryside around his home Finzean. Farquharson honed his talents in Paris where he studied under Carolus-Duran. His ‘etra-ordinary virtuosity’ and ‘lightness of touch was praised by critic and artist alike. In 1918, Joseph became Laird of Finzean in Aberdeenshire after the death of is father. Farquharson’s realism and tension in his art comes from his painting ‘en plein air’. Because of the harsh Scottish weather, he devised a painting hut which was pulled by a horse. It contained a stove and was made mostly of glass to allow light and visibility. 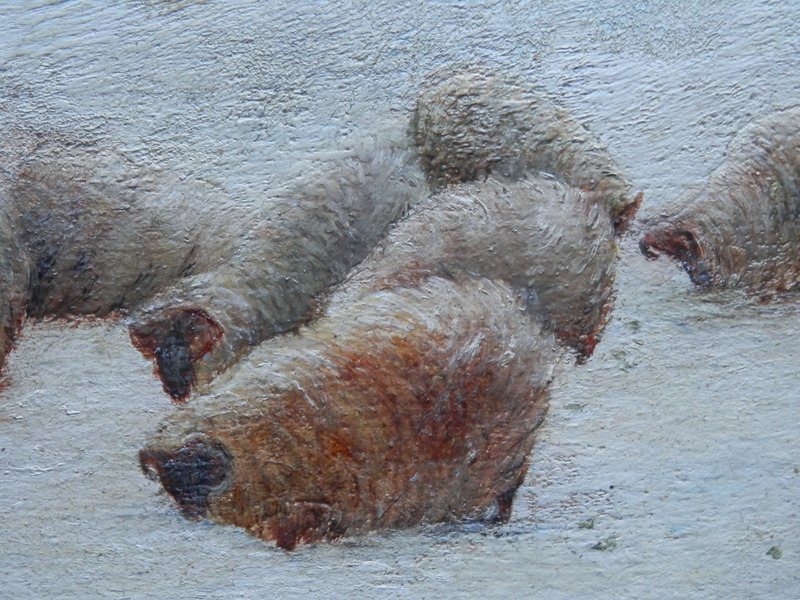 The human and dogs which were painted were real and posed for many hours while Farquharson painted but the sheep were not. They were ‘imitation’ sheep. Stuffed sheep which he could move into artistic position for is painting. 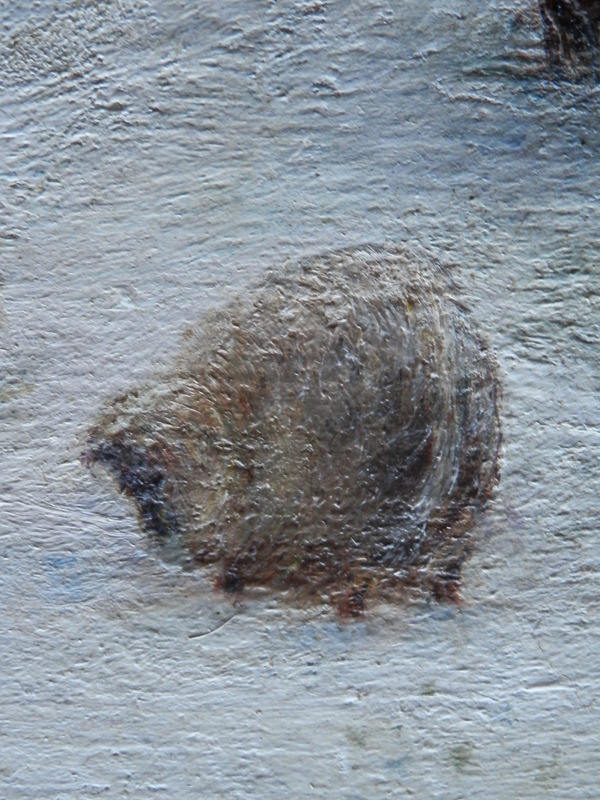 I have tried to add a number of close-up photos of the painting so that you might appreciate the finesse and quality of this artist. I really love the depth and 3D effect which he achieves in the painting of the footsteps in the snow. Below the matt can be seen a pair of initials JF ( the ‘f’ was normally stylised backward) in the lower left. If this painting is by Farquharson it would be the smallest study for ‘A Joyless Winter Day’ that I have read of or seen. 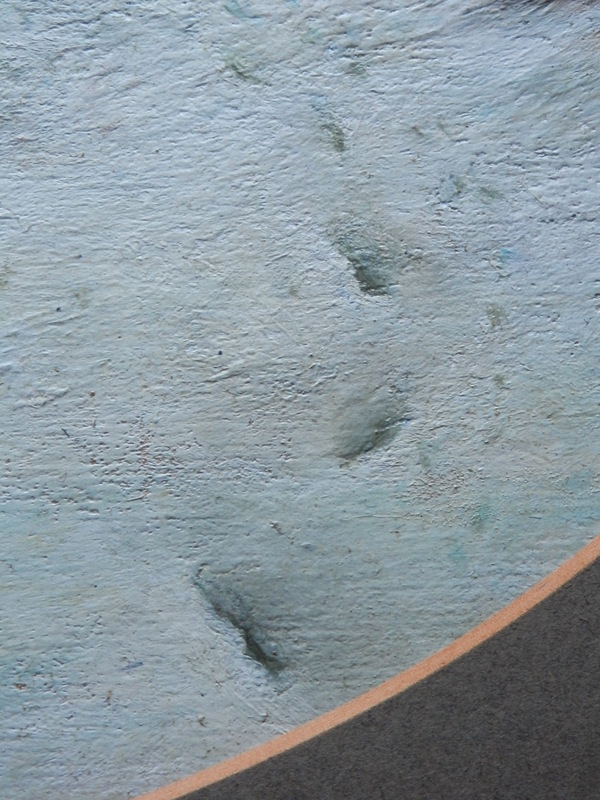 The oval is 226mm tall and 346mm wide (8 7/8 x 13 5/8). Whether it is or not the artist has sublime talent and technique which deserves to be recognised and appreciated. I hope you enjoy. 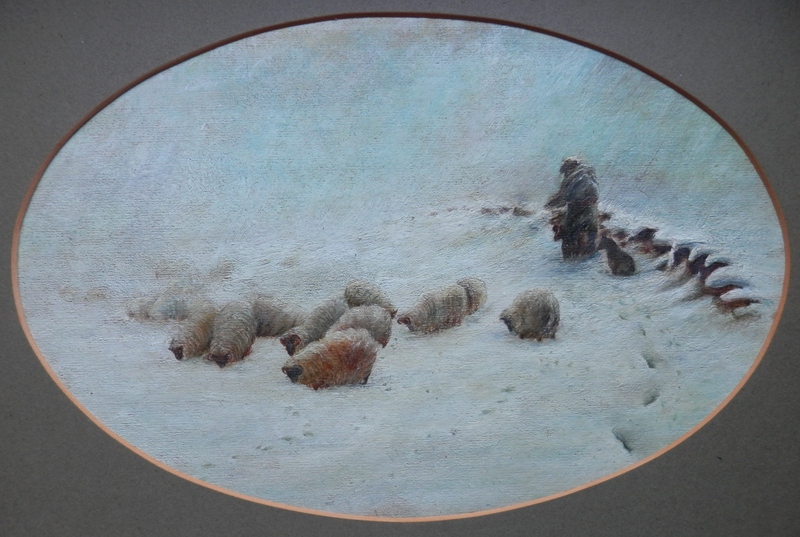 This entry was posted in Oil Paintings and tagged Finzean, Joseph Farquharson, Scottish, sheep, sheperd, snow, storm. Bookmark the permalink.